Make the dark a more inviting place and act out storylines with Mr Men & Little Miss Projector Torches. Project your favourite characters onto walls and ceilings for endless fun! For prices, full terms and further information, please see our delivery info page. If you have any problems with your purchase, please contact us or call us on 0345 505 9090 and we'll do all that we can to help. If you change your mind about your purchase you can return the items to us for a refund within 14 days of receiving the goods. You will be responsible for the cost of returning the goods to us in unused and re-saleable condition. Please contact us if you wish to arrange a return. For our full returns policy, please refer to this section of our t's & c's. Provide endless night time fun and project your favourite Mr Men and Little Miss characters onto walls and surfaces for entertainment at bedtime! Ideal for dark bedrooms, act out stories for your favourite Dillydale characters and make the dark a much more fun and inviting place. 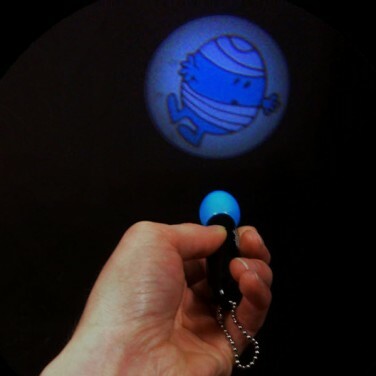 Handy keyring sized, the Mr Men/Little Miss Projection Torch is small enough for little hands to easily control, making it ideal for little ones that need a little encouragement in the dark. Make bedtime fun and intriguing for your child with glow in the dark products and soothing lighting. The better they sleep, the better you sleep! © Glow2Sleep 2019. All rights reserved.